Kay Stockholder, "Thinking About Shakespeare"
Explores the challenges of maintaining bonds, living up to ideals, and fulfilling desire in Shakespeare's plays In Thinking About Shakespeare, Kay Stockholder reveals the rich inner lives of some of Shakespeare's most enigmatic characters and the ways in which their emotions and actions shape and are shaped by the social and political world around them. 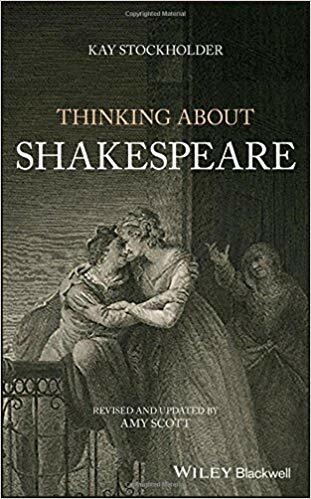 In addressing all genres in the Shakespeare canon, the authors explore the possibility of people being constant to each other in many different kinds of relationships: those of lovers, kings and subjects, friends, and business partners. While some bonds are irrevocably broken, many are reaffirmed. In all cases, the authors offer insight into what drives Shakespeare's characters to do what they do, what draws them together or pulls them apart, and the extent to which bonds can ever be eternal. Ultimately, the most durable bond may be between the playwright and the audience, whereby the playwright pleases and the audience approves. The book takes an in-depth look at a dozen of The Bard's best-loved works, including: A Midsummer Night's Dream; Romeo and Juliet; The Merchant of Venice; Richard II; Henry IV, Part I; Hamlet; Troilus and Cressida; Othello; Macbeth; King Lear; Antony and Cleopatra; and The Tempest. It also provides an epilogue titled: Prospero and Shakespeare. Written in a style accessible for all levels Discusses 12 plays, making it a comprehensive study of Shakespeare's work Covers every genre of The Bard's work, giving readers a full sense of Shakespeare's art/thought over the course of his oeuvre Provides a solid overall sense of each play and the major characters/plot lines in them Providing new and sometimes unconventional and provocative ways to think about characters that have had a long critical heritage, Thinking About Shakespeare is an enlightening read that is perfect for scholars, and ideal for any level of student studying one of history's greatest storytellers.